“Sri Baladeva is the Supreme Personality of Godhead Himself. He is equal in supremacy to the Supreme Godhead, yet wherever Krsna appears, Sri Baladeva appears as Krsna’s brother, sometimes elder, sometimes younger”(SB 10.1.24p). “In His vaibhava-prakasa feature, Lord Krsna manifests Himself as Balarama. The Balarama feature is as good as Krsna Himself, the Only difference being that the bodily hue of Krsna is dark and that of Balarama is fair” (TLC Chap.7). ‘These two Lords, Krsna and Balarama, are each the seed and womb of the universe, the creator and His creative Potency. They enter the hearts of living being and control their Conditioned awareness. They are the primeval Supreme’ (SB10.46.31v). Balarama is the servitor Godhead who serves Lord Krsna in all affair of existence and knowledge. The transcenden­tal abode exists by the energy of Lord Balarama. 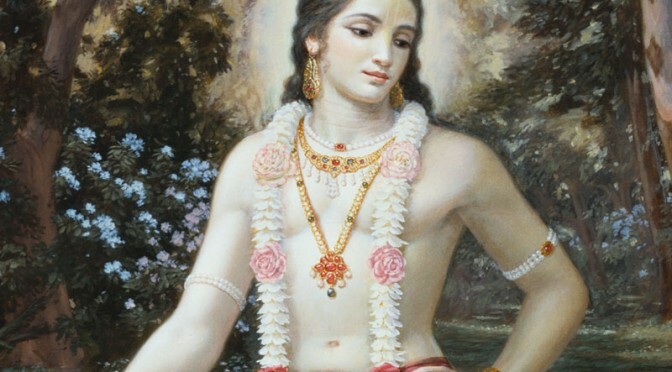 Krsna’s first expansion in a form for pastimes is Balarama. Balarama Himself helps in the pastimes of Lord Krsna and He does the work of creation in four other forms. In all forms Balarama tastes the transcendental bliss of serving Krsna” (CC Adi 4.8-11v.). “If we develop consciousness of this fact, then we are in actual Krsna consciousness. We should always remember that Krsna is the only Supreme Master and that everyone else is His servant ekale isvarah krsna, ara saba bhrtya. Either Narayana or Lord Siva, everyone is subordinate to Krsna. Even Baladeva is subordinate to Krsna’ (SB 10.13.53p.). “1n the transcendental pastimes, Krsna is the chief hero, and Balarama provides additional help.” (SB 10.8. 27p.). Lord Balarama is constantly serving Lord Krsna in every respect. In all of Krsna’s incarnations and pastimes Lord Balarama is always present serving Krsna in different forms and manifestations. In Rama-lila, Balarama serves Lord Ramacandra as His younger brother, Laxman. 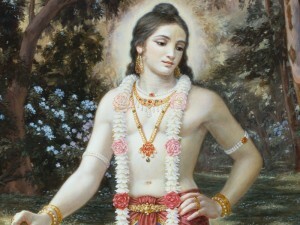 In Kali-yuga, Sri Balarama spreads the Sankirtan movement of Sri Caitanya as Lord Nityananda. Lord Balarama serves Sri Krsna in all the five rasas (mellows), from santa to madhurya rasa. 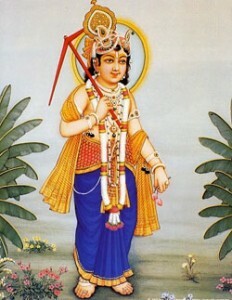 In santa rasa Lord Balarama fulfils Sri Krsna’s desires for blissful transcendental pastimes by expanding Himself as the holy dhama of Vraja Mandala. All of Krsna’s personal Possessions such as Krsna’s crown, bed, clothes, throne, ornaments; and any other object that Krsna utilises are all expansions of Lord Balarama. As Krsna’s cowherd friend and elder brother in sakhya rasa, Sri Balarama sometimes accepts service from Krsna after defeating Him in a wrestling match. But generally, Balarama ‘s fraternal feelings are mixed with servitude (dasya rasa) and parental affection (vatsalya rasa). In the mood or vatsalya rasa, Sri Balarama sometimes protects Krsna as a parent or chastises Him as the elder brother. 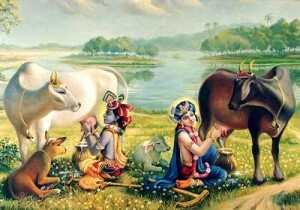 “Once Lord Balarama told Subala, ‘My dear friend, please inform Krsna not to go to Kaliya lake today. Today is Krsna’s birthday, and so I wish to go along with Mother Yasoda to bathe Him. Tell Krsna He should not leave the house today! This shows how Balarama, Krsna’s elder brother, took care of Krsna with parental love, within the scope of fraternal affection” (NOD Chap. 42). 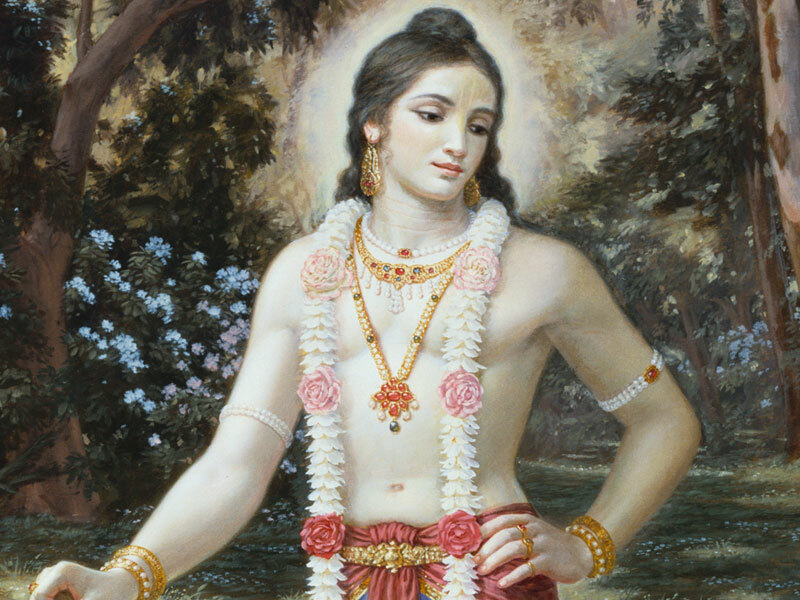 Lord Balarama can expand Himself into unlimited and different forms. In order to serve Sri Krsna’s intimate conjugal pastimes in madhurya rasa, Lord Balarama expands Himself as Ananga Manjari. Ananga manjari wears beautiful clothing the colour of a blue lotus flower and She is especially dear to Lalita and Visakha. “Lord Balarama is called “Douji” (the elder brother who protects and cares for the younger brother). After lifting Govardhana Hill Lord Krsna killed a succession of ferocious demons including Sankasura and Aristasura. Balarama hadn’t killed a demon for a long time, and He was concerned about Hi duty of protecting Krsna as His elder brother. Desiring to dress like Krsna, Lord Balarama once asked Krsna if He could wear His peacock feather and play Krsna’s flute for just one day. 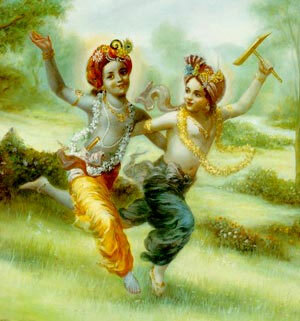 Krsna, who dearly loved His elder brother, agreed and personally gave His peacock feather and flute to Balarama. “ Krsna and Balarama warmly embraced and then Balarama laughing happily, ran away playing gaily on Krsna’s flute. Mean-while, in Mathura, the wicked King Kamsa was about to send the horse demon, Keshi, to Vrindavana in order to kill Krsna. The Keshi demon asked King Kamsa, “How will I recognise Krsna?” Kamsa told him that it would be easy to tell, because Krsna would be the only person wearing a peacock feather and playing a flute. “While Balaramji was fully enjoying His pastime of being Krsna for the day, the fierce horse demon, Keshi, stormed into Vrindavana. Seeing Balarama wearing a peacock feather in His crown and playing a flute, matching the description King Kamsa had given of Krsna, the Keshi demon roared up and gave Balarama a mighty kick that could have killed a full-grown elephant. This kick totally knocked the wind out of Balarama, and sent Him tumbling far away out of the demon’s sight. Thinking that he had killed Krsna, the Keshi demon galloped away. Balaramji, picking Himself up, began to cry. Balarama’s chest still hurting from the demon’s kick and He was short of breath. Balarama was hungry, very tired and sore all over from tumbling so far. “Reaching home, Balarama immediately went to Krsna and returned His flute and peacock feather. Balarama told Krsna that He never again wanted to wear them, and that a huge horse demon had just violently kicked Him; thinking He was Krsna. Then Balaramji met His mother Rohini and fell asleep in her arms. “Krsna replaced the peacock feather in His crown, tucked the flute back in His belt and walked into the village. Then Sri Krsna met the horrible horse demon and effortlessly killed him” (SVMP).